The site code is incorrect. Please contact your teacher or administrator for the correct site code. Orchard Now combines the power of the Web with critical tools schools need for student achievement and school improvement. 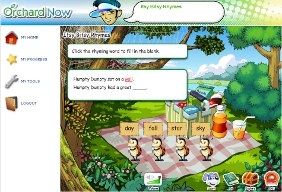 Developed by the publisher of award-winning Orchard Software and PracticePlanet, Orchard Now provides a customized learning environment with activities, practice and assessment for schools to address the needs of all students. Students are placed into their state standards-aligned learning path based on pre-assessment results. Orchard Now automates data collection, analysis and reporting for easy progress monitoring. Orchard Now ELIMINATES THE DELAY BETWEEN RECEIVING TEST SCORES AND REMEDIATION FOR IMPROVEMENT. GET RESULTS WITH ORCHARD NOW! Engage learners with dynamic, motivating content. Place students in instruction for remediation immediately. Educators may select from state-correlated or Common Core Standard assessments when selecting student assignments. 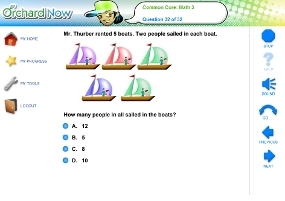 Orchard Now reports help teachers easily identify those Common Core Standards students have made progress on and those they are still struggling to master. Orchard Now's latest product release includes the correlation to the Common Core Standards. With this correlation, educators can be assured that Orchard Now's instructional activities, assessment, and practice cover the skills and knowledge found within the standards. More on Orchard Now Common Core Standards. Interested in Orchard Now's correlation to the Common Core Standards? Request a demo, contact your sales representative, or call 1-800-351-1404. 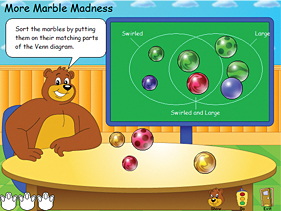 Interested in Orchard Now's Math Concepts 4-6? Learn more. Looking for Orchard Now Language Concepts details? Learn more. Have you heard about Orchard Now’s Remedial Math? Learn more. © 2010-2011 Orchard Learning, Inc.